At NMMU we believe in fostering excellence and have developed a prestigious Vice-Chancellor’s Scholarship Programme that recognises and rewards high achievers. Thirty top achievers were recently selected on the basis of exceptional academic merit. The Scholarship – value at R70 000 per annum – is renewable for each year of a first full-time NMMU undergraduate degree or diploma programme, provided academic performance remains of the highest standard. The Scholarship covers all registration and tuition fees, reasonable accommodation costs, the average cost of books and other study material, meals, the cost of transport to and from home, while any remaining balance will serve as a personal allowance. A Vice-Chancellor‘s Scholar has access to benefits that will enhance their academic experience. One of the most important aspects of receiving the Scholarship is to become part of a community of fellow recipients at NMMU. Scholars are given an opportunity through a tailor-made development programme to get to know students from around the country who share a commitment to academic excellence, and to enhance your academic and leadership potential. The Scholarship is open to South African students only. High-achieving school leavers and those who have taken a break from study for up to two years after Grade 12, who are entering university for the first time on the basis of the Grade 12 results, are welcome to apply. To be considered by the scholarship selection panel an NMMU Admission Score Point (APS) of at least 49 in the Grade 11 and 12 end examinations is required. Cambridge students with a school performance score of between 41 and 48 will be considered for selection. 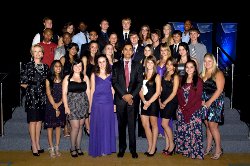 NMMU’s Vice-Chancellor, Professor Derrick Swartz (centre) and NMMU’s Chancellor Santie Botha (front left) congratulated the 30 new Vice-Chancellor’s scholars at a glittering function held on campus recently.